Australia ended a dismal seven-match losing streak in one-day internationals with a seven-run victory over South Africa on Friday. The hosts had not recorded a 50-over win since January, when England were beaten, and a target of 232 looked well within the Proteas' reach in Adelaide despite Alex Carey's 47. Dwaine Pretorius (3-32) and Kagiso Rabada (4-54) contributed handily to keeping that score down, but South Africa then similarly struggled with the bat. 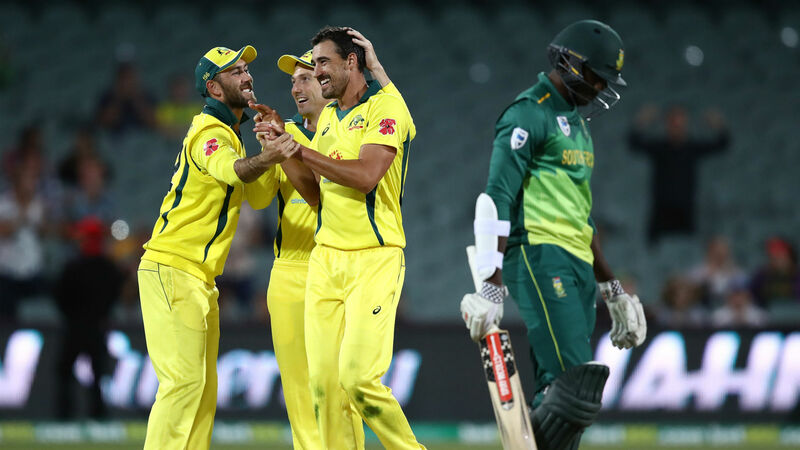 Faf du Plessis made 47 and David Miller 51, yet Marcus Stoinis (3-35) and Mitchell Starc (2-51) slowed the Proteas and they could only reach 224-9, setting up a deciding ODI against a suddenly rejuvenated Australia. AUSSIES WIN! A drought-breaking victory for Australia in Adelaide to level the series at 1-1! As in their opening defeat, Australia were relatively uninspiring with the bat, limited by Rabada and Pretorius who came to the fore after Tim Head (8) departed early. The Proteas bowlers ensured their hosts' momentum was stunted at regular intervals, with Rabada the first to intervene as Quinton de Kock claimed the earliest of a string of catches from Shaun Marsh for 22. Captain Aaron Finch (41) followed to Pretorius, before Rabada sent a bouncer to the dangerous Chris Lynn (44) and appeared to have a word with the departing batsman. Glenn Maxwell (15), Stoinis (2), Pat Cummins (3) and Starc (6) all went in a spell where Australia scored just 21 runs and then Carey, who had dug in admirably, became the latest man to be caught behind. South Africa still had nine deliveries remaining when Adam Zampa (22) was dismissed to have the hosts all out for 231, but the Proteas were not without their own early problems with the bat. De Kock made just nine and Aiden Markram (19) and Reeza Hendricks (16) lost their wickets in consecutive overs to leave South Africa at 48-3. That brought Du Plessis to the middle, though, and he looked to be carrying his side towards a routine chase, although Cummins denied him a half-century. From there, it became tense for the tourists. Miller reached 51 but saw his partners offer little fight, Pretorius and Rabada unable to repeat their magic with the ball to leave their team requiring 31 runs with just 17 balls and one wicket remaining. Rabada's wicket fell in a valuable maiden over from Starc and that was enough to ensure an improbably comfortable finale, South Africa falling seven runs short despite an attempted rally.